According to a CDC/NIOSH Powerpoint presentation RFP primarily produced plutonium triggers for and recovered plutonium from nuclear weapons. The September meeting had been called to address tritium exposure who worked with pits and special materials. 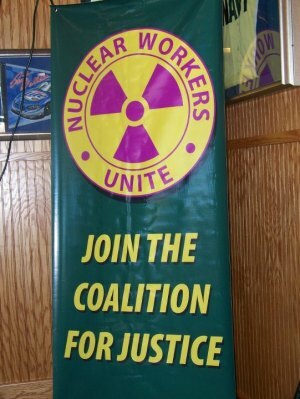 Terrie Barrie, founding member Alliance of Nuclear Worker Advocacy Groups (ANWAG), attended along with about 120 RFP workers. Barrie and Charles Saunders presented a petition asking that tritium exposure be added to worker exposures. Stu Hinnefeld, speaking for NIOSH, asked for additional time to study the petition, even as other NIOSH board members asked how the dose could be accurately reconstructed since it clears the body quickly. ANWAG deliverred a Powerpoint presentation arguing that NIOSH withheld petition information from the board members, NIOSH missed information, and NIOSH did not adequately consider worker affidavits.